a 50-year love story in the shape of a garden"
© 2014 Maurizio Corraini s.r.l. The story reported here are excerpts from the book "the Garden, a 50-year love story in the shape of a garden", realized in 2014 on the occasion of the 50th anniversary of the hotel. To those who have already been our guest, but especially to those who do not know us, we hope to transmit what for us is "the Garden". 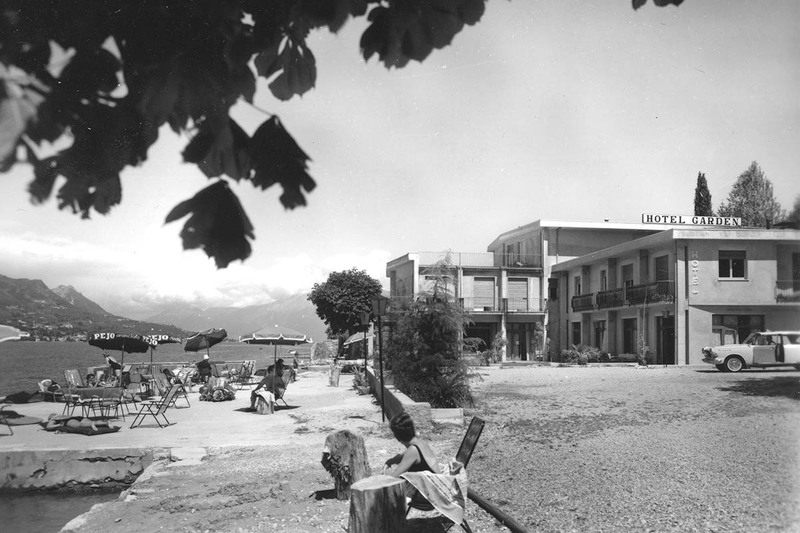 The Garden is a hotel that has come down from the mountains. It has gradually come to rest along the banks of San Felice del Benaco overlooking Salò and appears to be throwing down a challenge across that strange branch of lake winding inland. 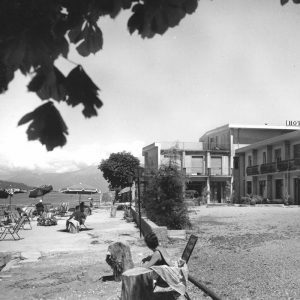 The Garden is a story of three different generations, a strange and also amusing story in which an alpine trouper and his wife set up a hospitality business along the banks of lake in which he has never bathed. The Garden also tells us a bit about the history of Garda over the last few decades, the enterprising ideas of a delightful family that has created somewhere full of sentiment and warm, sincere relations. It is also an example of a business whose books do not only contain the entries for income and expenditure but also the fondness, gratitude and satisfaction of its guests. The Garden also looks to the future, trusting in the changes already underway and those that the up-and-coming generation will surely make. 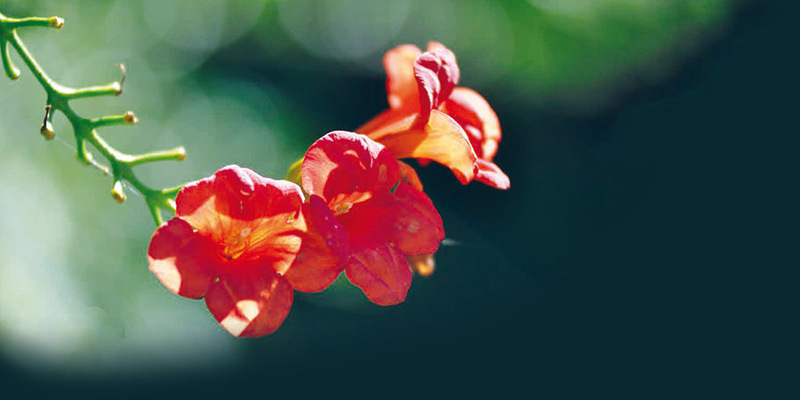 The Garden is a garden of inebriating scents and perfumes, a place where you can really feel the sweetness of life. But, above all, the Garden is a melting pot of love stories and friendships. And its guests are well aware of all this. family [...] the ideas we live by. The identity of the Garden spans across 50 years and three generations. Different approaches which, together, give it its heart and soul and underlying philosophy. The first generation were Aldo and Luciana, real mountain people, tough, tireless and determined. He was more closely tied to his traditions, valley, local people and values. She was more flexible, open-minded and thoughtful, just as a teacher should be. But they were both brave “strangers” in the land of Salò, as they set up their business along a bank of the lake that nobody wanted and very few people even considered. The second generation were Luca and Clara, imagination and dedication, a couple who devoted themselves to continuing the tradition, while intelligently opening up to trusted innovation, fully understanding and elaborating upon what their parents/parents-in-law had first begun. The Garden as it is now is a combination of two approaches, a pioneering attitude enhanced by plenty of invaluable cutting-edge innovations and by Luca and Clara’s kindness and tenderness. And then there is the future which is already in place in the form of Stefano and, who knows?, perhaps young Marco. 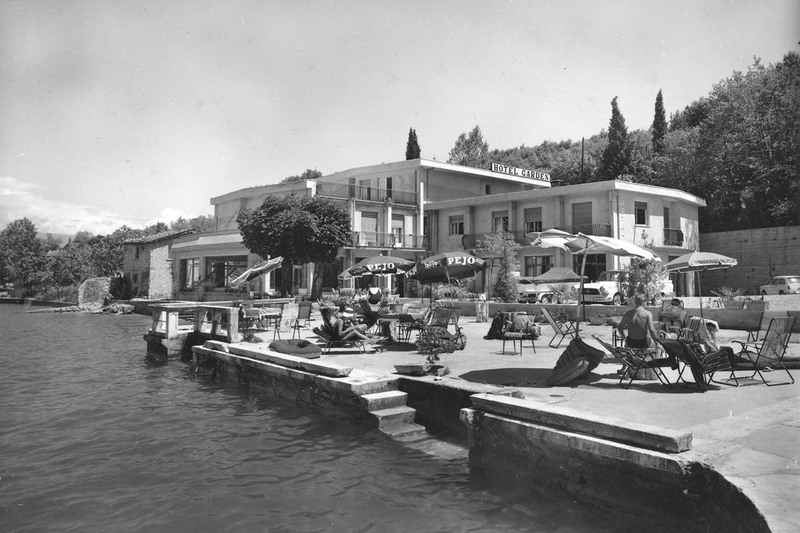 The third generation is busy studying the situation and comparing experiences, showing a capacity for analysis and visionary thinking, not to mention a strong sense of family tradition and an awareness of how changes might be required owing to external factors affecting hospitality in this wonderful setting. 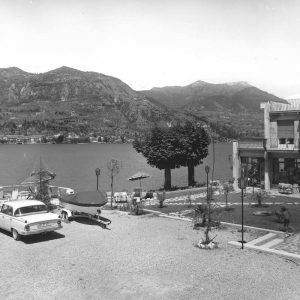 Just as three generations find themselves administrating/managing the hotel, likewise three generations of guests regularly come to stay along the lakeside. The guests who followed Aldo and Luciana from Torbole to Salò are the same people who have brought their children and grandchildren to enjoy the hospitality offered first by Luca and Clara and now also by Stefano. 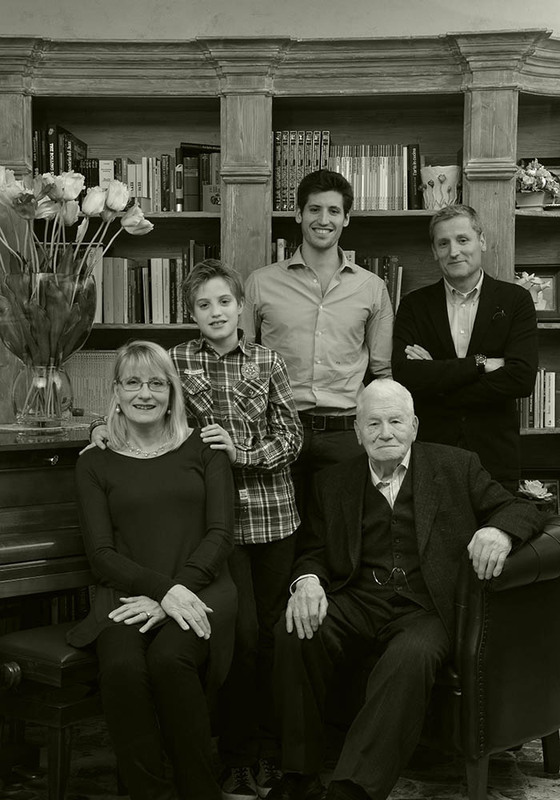 Three generations of managers and guests intermingle in a novel continuity that makes this family business a place of friendship. From the left: Clara ("the" Chef), Marco, Stefano (Marketing), Aldo (Founder) e Luca (the director). It is neither Salò nor the outline of the mountains running around the lake that Aldo is looking at from his armchair along the lakeside. The water has never interested him. He has never even be in the lake! Never gone on a boat! Nevertheless 50 years ago he fell in love with this place and he has never betrayed it. On the contrary, he has always loved it the way a father loves his family or a host loves his extended family of guests he insists on calling friends. Aldo’s life story is a bold adventure over a period of 91 years, the kind of life only a mountain man can live. 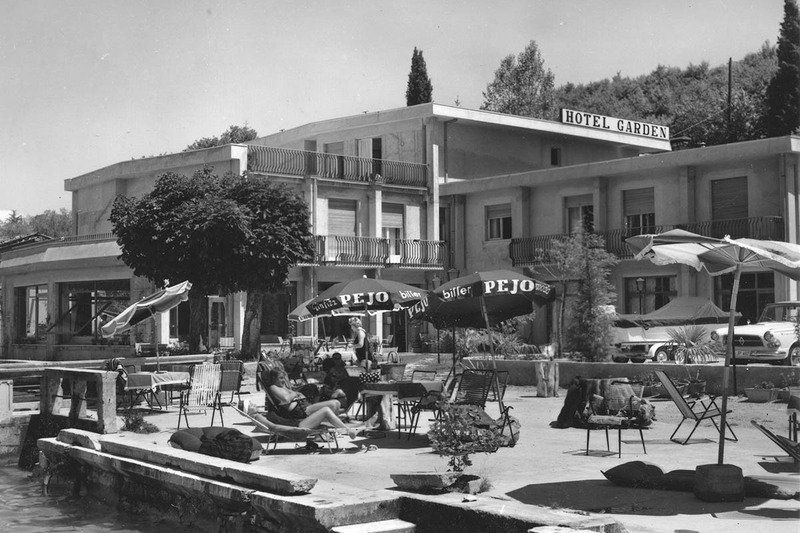 Aldo grew up in Malè and Pejo in an atmosphere of warm hospitality and fresh mountain air. He was an Alpine guide and ski instructor but studying and school certainly were not his cup of tea. His father sent him off to hotelier school in Turin for a year to learn the basics and then he spent a further six months gaining experience working in seven different hotels: as a cook, waiter, luggage handler and porter: Aldo’s training involved every imaginable job in a hotel. 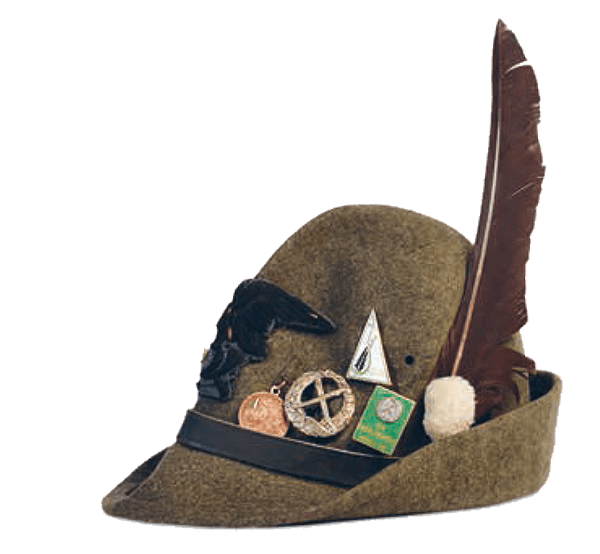 At the age of 19 he became a member of the Aquila Battalion of the Third Julia Division of the Alpine Troops and was sent off to Russia, where he found himself fighting against an enemy he knew nothing about but was, nevertheless, determined to do his duty and then return home. This experience helped him find the courage required to take on a business venture that meant leaving his family business in Malè and follow the good advice of his wife Luciana, who encouraged him to start a new life along the lakeside. 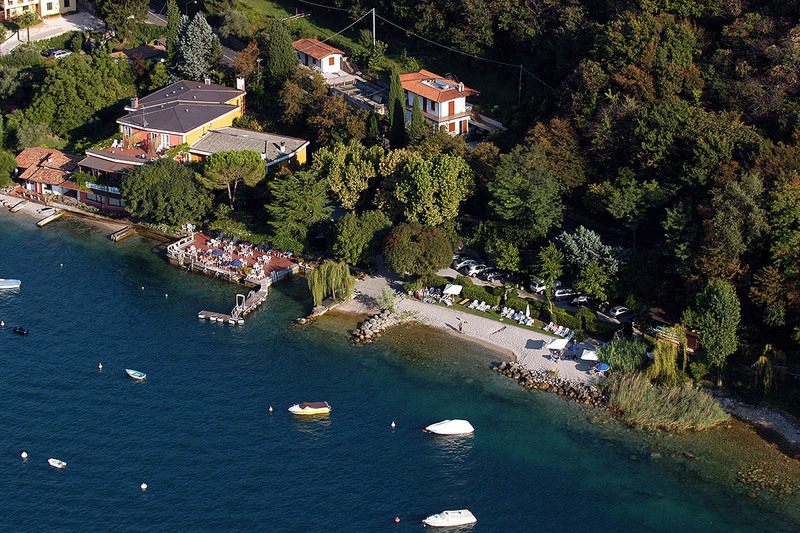 This first experience was close to the small town of Torbole, along the lakeside near Verona. 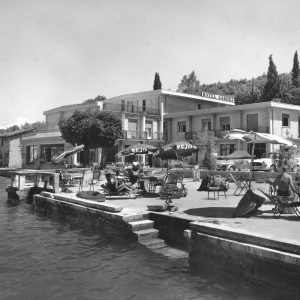 A lovely hotel situated along the lakeside, where he spent eight years building up his clientele base, who have mostly remained faithful to the Zorzi family and their way of running a hotel, always warm, welcoming and attentive to the guest’s needs. 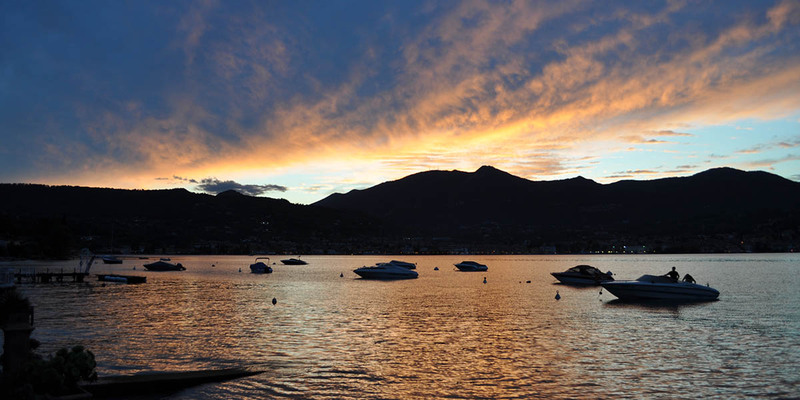 Then he decided to buy his own business and fell in love at first sight with the fishermen’s bank near San Felice del Benaco: it was the ideal location, the owners were ready to sell and friends of his at the bank were willing to provide the financial backing. 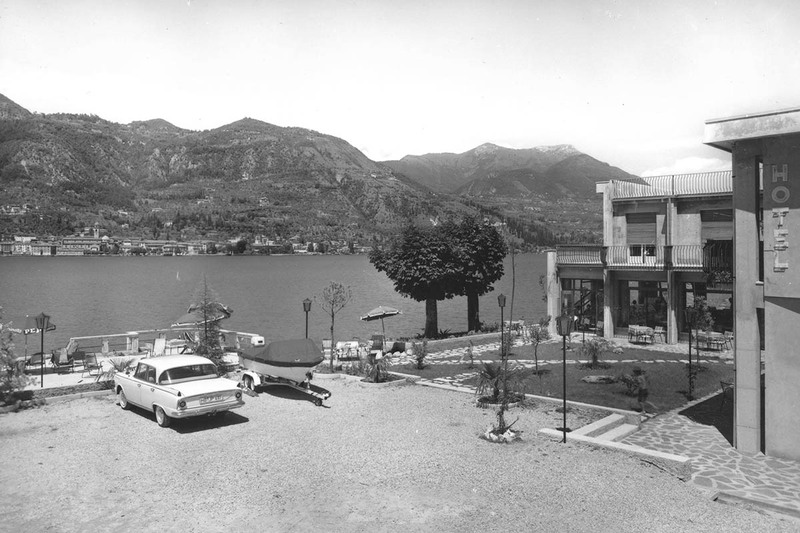 And there was the mountainside looming above the lakeside at Salò that looks as if it has been deliberately designed to evoke Val di Sole, where this story began. 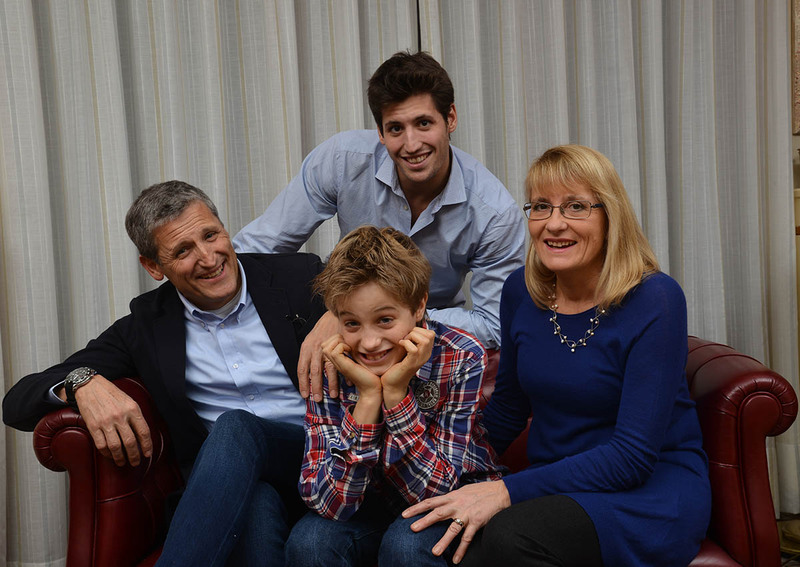 Luciana, Aldo’s wife and Luca’s mum, does not crop up very often in this story, because she left her nearest and dearest and her hotel in 2008. But she is always mentioned in everybody’s stories as the real heart and soul behind the Garden’s atmosphere and style in a way that only an intelligent woman could be. She showed the same love for her hotel and guests as she did for her family, as if it was all one inseparable part of her life. If the family works, the firm works as well. Luca, born in 1956, represents the second generation, intelligently carrying on and interpreting the Garden’s underlying roots and philosophy, while adding his own personal touch of friendliness, courtesy and attention to his guest’s every need. 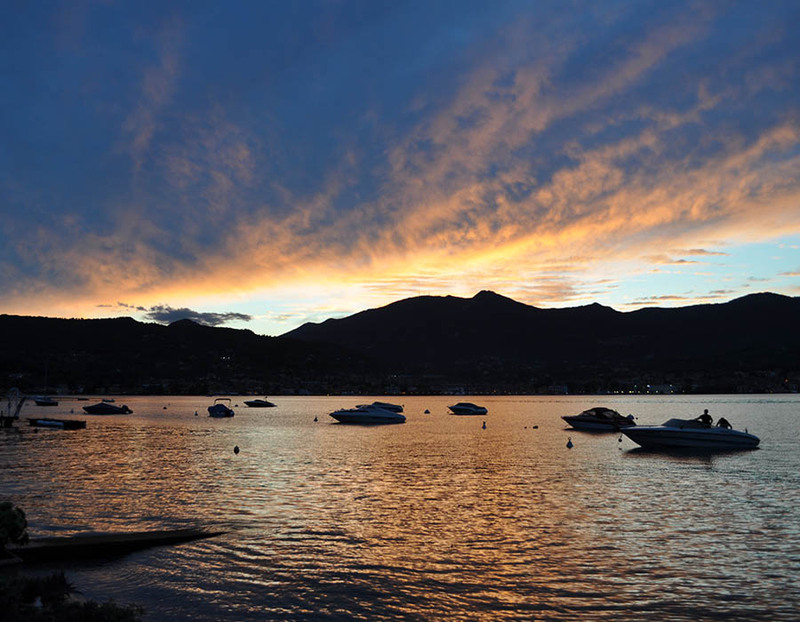 He also loves the lake, his garden and, first and foremost, his family. The hotel widened its horizons with Luca. He has a more gentle character than his father and is totally focused on his guests and their needs. He is naturally friendly and always ready to offer more than just a simple hotel service. Customer service is the hotel’s philosophy and Luca interprets it in the most radical way. The guests are friends staying not in a hotel but a home. This means always being ready to help them out, be at their service, sort out all their ‘paper work’ and even act as a translator. From the left: Luca, Marco, Stefano and Clara. The third generation of children are now entering the family hotel business. The first is Stefano, a 26-year-old graduate in economics for tourism from Rimini University with a Masters from Milan. The second is Marco, who is still very young but is growing up in an environment of hospitality. Stefano has a very rational and deliberately scientific approach to business, and it is only right that he should want to put into practice what he has studied. 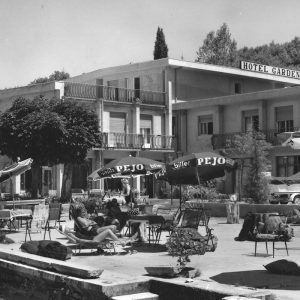 Nevertheless, this keenness to keep the accounts in good order and run the hotel business along scientific lines is still geared to the family’s own irreplaceable style, a style the hotel got from Aldo, Luca and Clara. Looking after the guests is of paramount importance and the warm atmosphere will never change, but new ideas are emerging under the benevolent and satisfied eyes of his parents, who embrace Stefano’s ideas as a natural progression as a new generation begins building on those firm foundations that have given the Garden its distinctive image over the last 50 years. Stefano has clear ideas that fit in perfectly and in a very modern way with the familiar way of running the Garden: his garden of ideas really works and helps introduce innovation into tradition. Clara liked doing the accounts, but she was swept away from her parents’ delicatessen and coffee shop by her love for Luca and desire to have a family with him at the Garden. Her destination was almost inevitably the kitchen, a place she was already familiar with at her father’s place, although the scale, pace and professionalism of this new kitchen were quite different. She is now the heart and soul of the kitchen, only very rarely handing over the reins when Aldo is asked to cook his legendary dried and salt-cured cod. Clara’s cooking is a nice balance between the Garda family style and gentle experimentation aimed at introducing something new into tried-and-trusted family recipes. 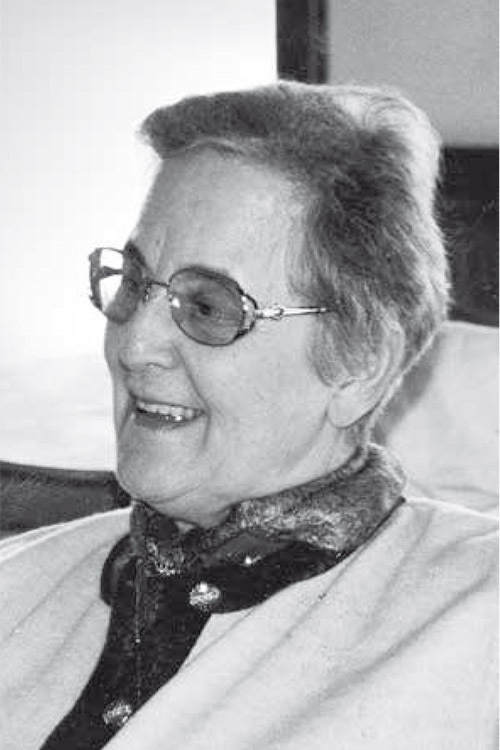 There are references to Mantuan cuisine from her father’s side and South Tyrol cuisine from her mother’s side and also enduring links with Castellaro Lagusello and the morainic hills of Mantua and the Tyrol. Guests are almost forced to venture into Clara’s world, at least as regards flavours and experimentation. The family has already entered this world of flavours and is more than satisfied and guests are now gradually entering through the main door into the family’s simple and, at the same time, elaborate Italian cuisine that is both rich and poor, light and flavoursome. Clara’s cooking is based around flavours, it is more savoury than sweet, more earthy than watery. It is local, neighbourly cooking based on carefully chosen produces and attention to the guests’ palettes. It is a very distinctive kind of cuisine that forces foreigners to become Italian. The lights go out very late over on the other side of the lake. Over here all you can hear is the gentle lapping of the water and some distant voices chatting away at the end of the day. The mountain looming above Salò provides a foretaste of what lies in store the following day. The bedroom lights slowly go out. You can hear the last noises coming from clearing up operations in the kitchen and table setting in the dining room ready for breakfast. The warmth of the evening promises another beautiful day ready to envelop guests in a sense of well-being and family comfort. A breeze blows through the trees in the garden and the shadows start to flicker. The Zorzi family home is resting and getting ready. A community working on a joint project.